Deciduous fruit trees demand to spend their winters in certain ways. Peaches, plums, apricots, apples, cherries, nectarines, they like to get chilly in the fall, then shed their leaves and stay chilly for a certain length of time, then warm up in the late winter or early spring and make flowers — a bunch of flowers all at once. 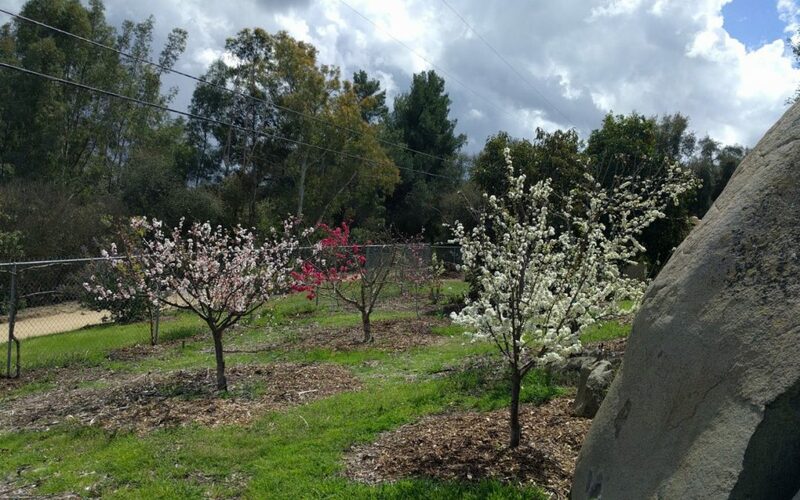 Pictured above are some of my stone fruit trees making a bunch of flowers all at once. They are telling us that they had a fantasticly chilly winter. They are suited to the past winter’s climate in my yard. How do your deciduous fruit trees look this spring? Are they flowering in a heavy, concentrated way? If not, then don’t expect them to in the future. They probably aren’t going to experience a more consistently cold winter in Southern California anytime soon. What kind of winter did we have? Many parts of Southern California had a winter for the record books, just like my nook of San Diego County did. I’m in an area called Ramona, and the National Weather Service says that in February we had the coldest average temperature ever recorded: 47 degrees. More important for deciduous fruit trees, January and December were also consistently cool. The winter of 2018-2019 was three successive months of steady chill. I keep temperature records for my yard, and the highest temperature between December 1 and March 15 was only 71 degrees. And in February there were two full weeks where my yard did not even rise as high as 60 degrees. That’s cool, consistently cool. We never even had our usual Santa Ana spell around New Year’s. It was the best winter for deciduous fruit trees that we can hope for, ever. What do deciduous fruit trees want from a winter? Deciduous fruit trees of all types vary slightly in their winter preferences in terms of how long the winter lasts and how cold it gets, but they all seem to have an internal clock that counts how long it stays cool and whenever they’ve reached their requirement (and the air warms up), they wake up and flower. 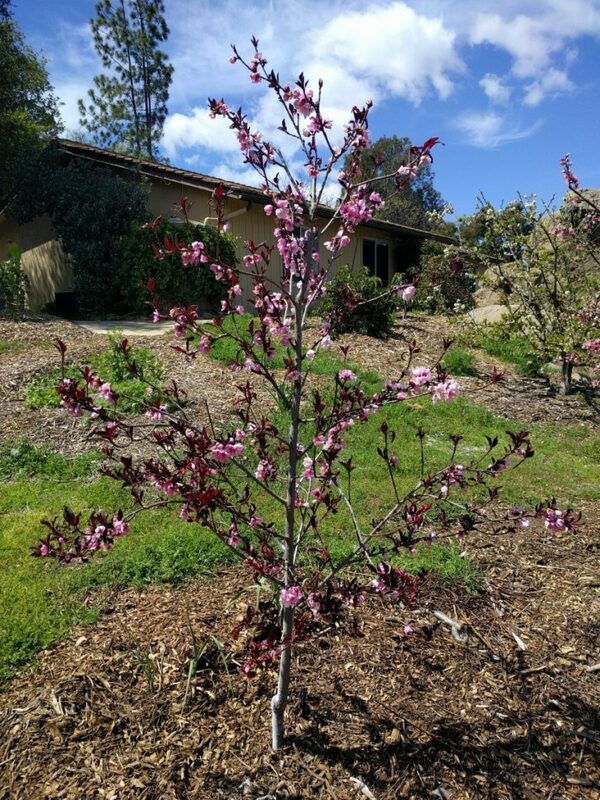 A Babcock peach only needs to be chilly for a short time while a Bing cherry needs to be chilly for longer than our winters ever last in Southern California. 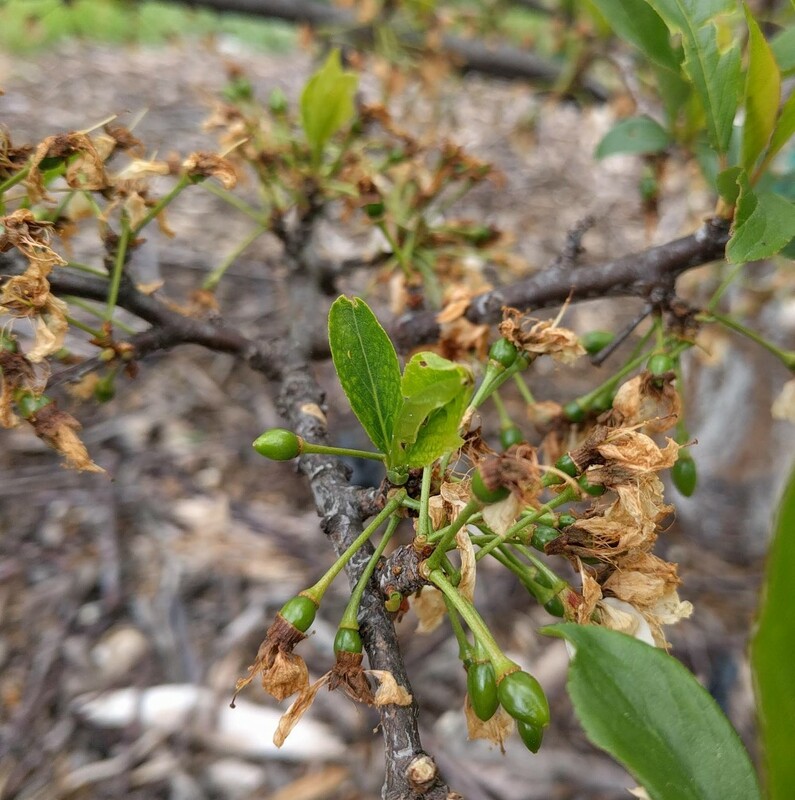 Researchers are continually learning more about exactly what deciduous fruit trees need in their winters, and last week I listened to an interesting interview with one such researcher named Katherine Jarvis-Shean of the University of California. About the fact that trees prefer consistent chill, Jarvis-Shean likened winter to filling a bucket. Cold nights fill the bucket, but a winter warm spell (Santa Anas near New Year’s, e.g.) dumps out some of the accumulated chill. Jarvis-Shean also noted that during unusually warm winters pollenizers sometimes don’t bloom at the same time as the trees they’re meant to pollenize. Pluots, for example, need to be pollenized by another pluot or certain plums. Unusually warm winters will cause these trees to bloom at different times compared to when they meet their chill requirements in a colder winter. Synchronicity of bloom should result in a ton of pluots this summer. I’m starting to see flower petals dropping and fruitlets appearing today. What does all this mean for our yards? 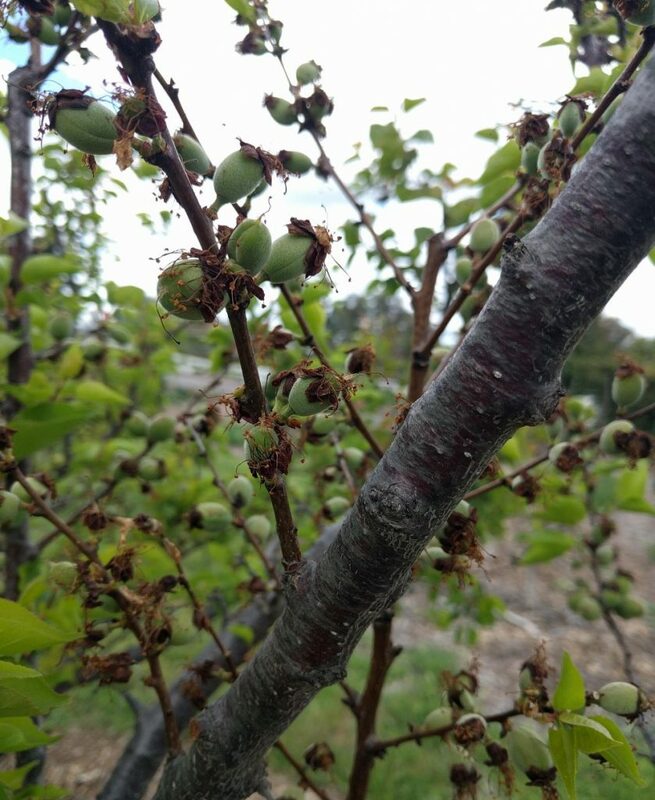 This year is the time to consider removing deciduous fruit trees that don’t set a good crop or figuring out what else is wrong because these apricots, cherries, plums, pluots, peaches, nectarines, apples, etc. all experienced the coolest winter they will ever give it. 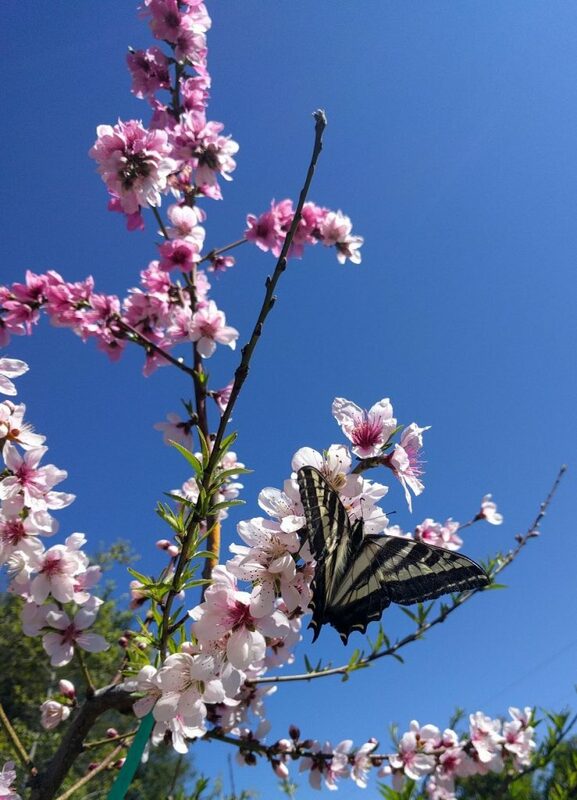 Swallowtail on peach blossoms. I’ve noticed that pollinators visit more when a tree’s bloom is heavy and concentrated. What are the other possible problems for a deciduous fruit tree not fruiting well this year? 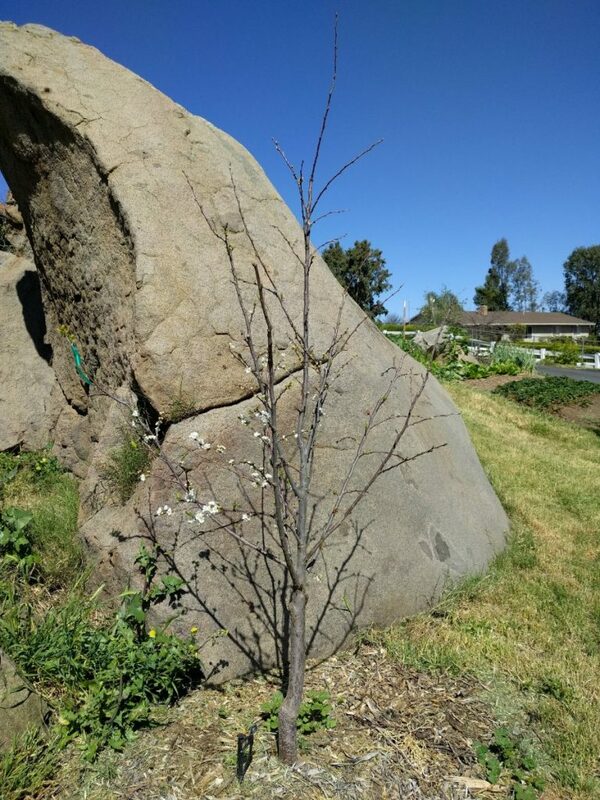 Earlier today, I had a wonderful time speaking about fruit trees to the Carlsbad Garden Club, and I was reminded of the myriad other factors that can be holding a tree back from fruiting as one hopes. Also, if a tree has only been in the ground in your yard for a year or two, then make no conclusions yet. Some trees need to grow for a couple years before they develop fruiting wood. This is especially applicable to cherries, but all trees should bloom and fruit more as they get older. Not enough sun can be a problem, but that’s not the issue with my SpiceZee nectaplum. I’m keeping a close eye on this tree. The tree’s bloom last year was weak, which I ascribed to the warm and wacky winter. Disappointingly, this year’s bloom isn’t far better. But since the tree is still young (planted as a bare root in January 2017), I’m forgiving its moderate bloom and hoping that it sets a moderate crop. At this date, it’s still too early to tell. One final thing to remember is that trees have different schedules. Most apples wake up from the winter later than other kinds of trees. My Pink Lady apple is only swelling its first couple buds today whereas my Blenheim apricot, which is adjacent, is already finished flowering. This is natural and nothing to worry about. Pink Lady and Fuji apple trees. Thanks Greg. Very helpful. Last year my plum tree barely flowered. Just recently it budded and is full of flowers. Tree life and cycles are interesting. My 4 year old Fig tree is sprouting new leaves..and hope for a big crop of tasty figs. Hey Greg I have a Katy apricot that has been in the ground for three years. Have yet to get it to flower. Was surprised this year that it didn’t flower. Do you have any experience with Katy apricots? Any input would be appreciated. Keep up the great blog! I don’t have a Katy apricot in my yard, but I have been keeping tabs on different apricots in other people’s yards for some years, one of which is a Katy. This tree is in the Scripps Ranch part of San Diego, Sunset Zone 21, and it is about six years old. The last time I checked in it had yet to produce a single fruit. I’ll try to get an update though. Do note what Bob says about his Katy below (at least five years in the ground yet now is blooming for the first time). I’m working on a post about apricots so please keep me updated on yours, and hopefully soon I’ll gather all the info I can and post on it. Thanks! Over by SDSU (either west end of 10A or east end of 10B depending on what map you look at) the bloom on all of our trees was and still is phenomenal. 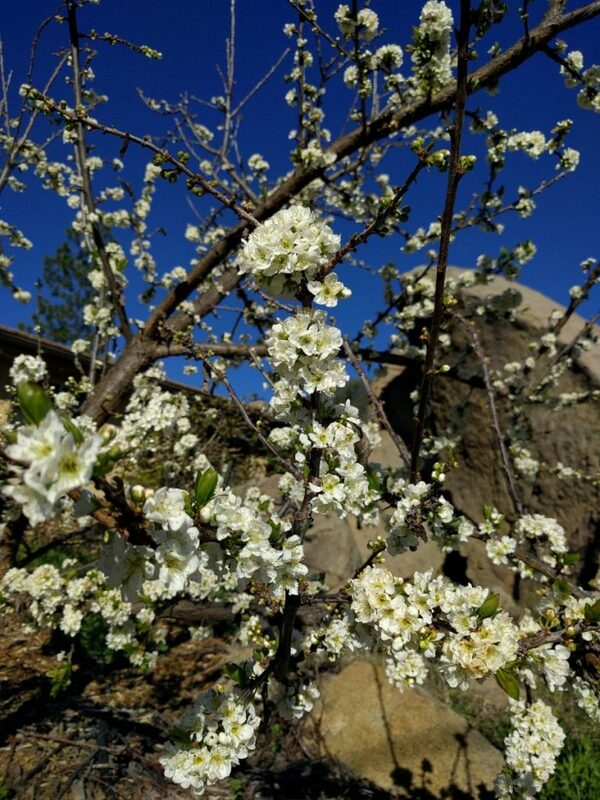 I have a 4-1 pluot (splash, geo pride, flavor grenade, emerald drop) that I hacked back last year to start over and it forced blooms from the stumps and little branches. It needed to be brought under control to let the flavor grenade catch up. 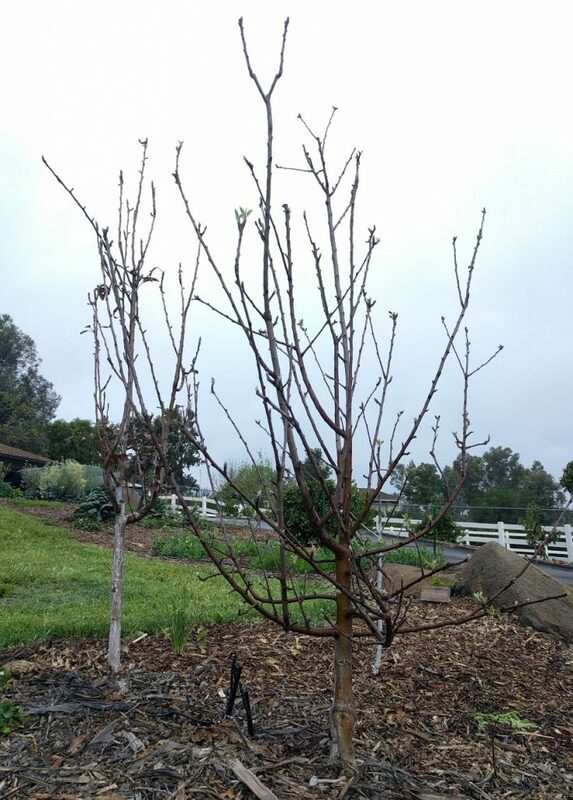 Our other 4-1 pluot (flavor king, queen, supreme, dapple dandy) just went in last year and it’s out of control for such a small tree. Our last pluot, the flavor finale, has flowered as well and I believe it’s a high chill variety, at least for this area; nothing to report on fruiting yet. Our 5-1 (Babcock, fantasia, Santa Rosa, Blenheim, July elberta) had the best bloom I’ve ever seen it have but the proof will be how many fantasias set. We rarely get more than 5-10 of these fruit in a season. 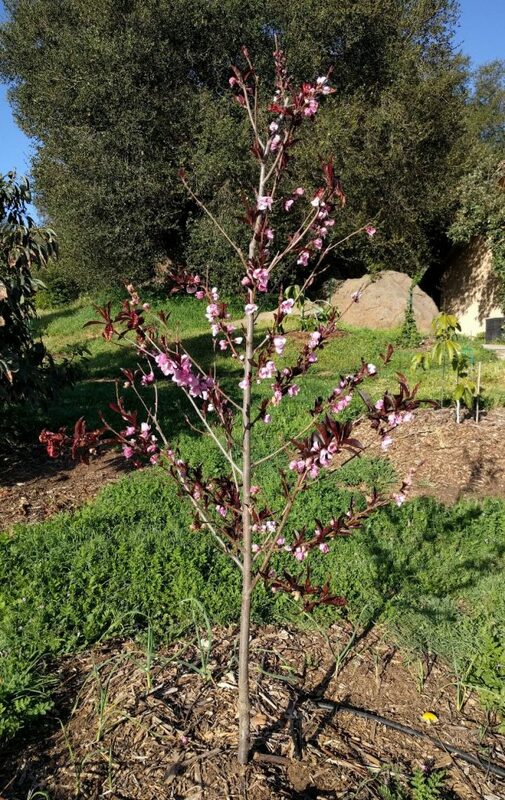 The Katy apricot has had it’s first bloom ever (at least 5 years in the ground) and it looks to have set fruit and our Autumn glow apricot is definitely setting fruit. 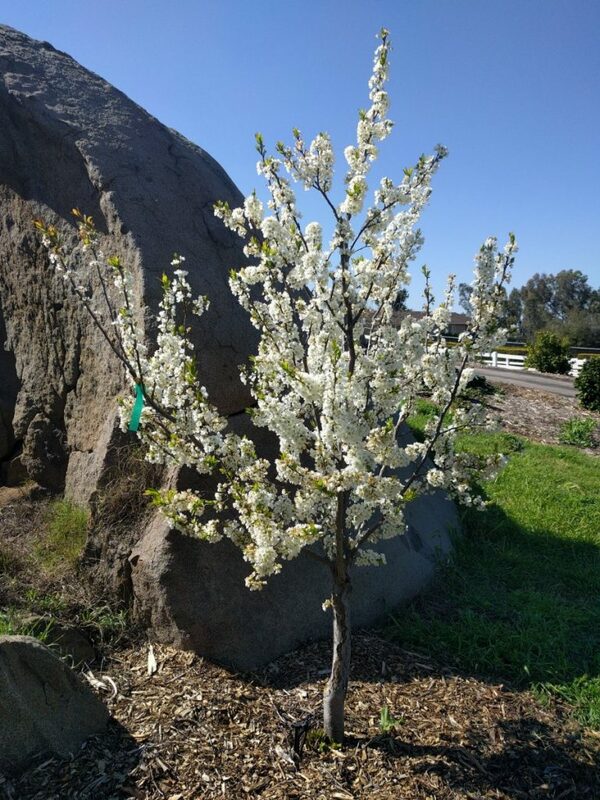 We just put in a Kaweah peach last year and it’s full of blooms on it’s tiny frame. The atomic red and arctic star white nectarines are full as well. The tropic snow and august pride peaches also saw an incredible bloom as did the earlitreat peach, desert delight and desert dawn (last ones are nectarines). As for the spice zee, we had the same issues both years as you did. Last year was weak and this year it didn’t go crazy like the others. our Eva’s pride set the most fruit I’ve ever seen and this is the first year that the flavor delight aprium is going to give us a real crop. The bloom was huge but the jury’s still out on the candy heart pluerry actual fruit count. Interestingly enough our lapins cherry has done nothing yet and our Minnie royal put out a small bloom, some leaves and then appeared to die. It might be coming back, though. As for our royal lee, it’s out of control with flowers and fruiting despite the dead looking Minnie royal (it’s pollinizer) so there must be some other pollinator around. The Satsuma and Burgundy plum trees had tons of flowers and I expect a huge crop. The last of our rear yard trees are the Carnival, Fairtime and Rubidoux peaches. The fairtime has never fruited but it may this year as it made some flowers. The Carnival just went in last year and it’s got a lot of fruit and the Rubidoux has a pretty big crop as well. These peaches are very late season varieties. We have one tree up front and it’s a 4-1 (Florida prince, desert gold, may pride and mid pride). There was that slight warm up in January and it took advantage of it with it’s early bloom and I expect our first peach will be the Florida prince at the very end of the month. Typically, that’s our first peach and we get it on April 26, but the cool of this year may delay that. The mid pride didn’t flower too much but did set fruit. So, as you can imagine, I’ve been thinning fruit every few days for the last several weeks and I can safely say that I’ve never seen thinning like this. When we planted these trees I planted a few oddball ones (higher chill types not for this area) and I told my wife that we may see fruit from these trees once every seven to ten years or so and this appears to be one of those years. I’m pretty sure we were still adding up chill hours over here well into March. The varieties I mentioned above were planted by design to have sequential stone fruit harvesting starting in late April going into September or maybe even early October. Of note with regards to peach/nectarines, I’m seeing a lot of peach leaf curl and I’m pretty sure that’s because I couldn’t spray as I wanted to as it kept raining. Regardless, the leaf production has also been really amazing this year so the trees are looking good even with some curl. I’m guessing that’s either a Red Barron or an Atomic Red tree in the rear of that picture at the top of the post. Let me know if you want a followup report on how the fruit set finally panned out. You are the first person that I have seen mention the Carnival Peach. Mine is about 4 years old. I had to order it from northern CA. Did you buy your tree locally? It has not produced much, but it is a very good tasting peach and ripens after my August pride peach. I wanted to plant an early Elberta peach, but the chill requirement is over 500 hrs. After 8 years I decided to plant one and it is my favorite peach and it produces even in the warmer winter years. What a surprise! I’m located in Del Cerro on a hill side, I get the warm mission valley breeze. Last year my Aprium had only 6 fruit. This year it is loaded! I should be able to get some before the rats do. Are you also growing avocados and citrus? I got my carnival peach online from up north as well. It’s only been in the ground for 16 months or so and last year it didn’t do anything (1st year) but this year I just thinned it to about 20 fruit and I’ll probably reduce that to 10 after I see what sticks around. I’m glad to hear it makes a tasty fruit and is in fact late season. I purposefully planted mine in an area that will get more chill hours than other places in my yard but it may suffer with afternoon shade in the late season. I’ll see what happens and if I have to move it in the winter I will. Also, my Rubidoux peach is later than August Pride and reliably produces fruit. I seem to recall picking some of those in early September last year. Yes on citrus, lots and lots of citrus. I’ve had a horrible time getting my avocados to grow and have lost several trees. I’m much better with stone fruits and citrus but have decided that this will be the year of the successful avocado. I’m guessing you’re either south facing or west facing on Del Cerro. That’s gotta be a great growing area. I’m south of SDSU about a mile or so. Just to chime in on Elberta peach. My aunt who lives up a slope in Corona (so not much winter cold) has an early Elberta peach (Gleason strain). When I first saw it a few years ago I said skeptically, “Do you get any fruit from this?” She said she gets plenty of fruit every year. It’s growing within spitting distance of a beautiful Hass avocado tree. So much for chill hour ratings, eh? I greatly appreciate your taking the time to detail how your trees are doing. Since you have so many varieties, and since you are in a middle climate for our region (warmer and closer to the ocean than me, but not as mild as where I used to live in Point Loma, for example), your observations are very valuable. My Lapins cherry is just barely pushing out some leaves now too. It’s as late as my apples, and far later than the Royal Crimson cherry next to it. I’d love to hear your impressions on the eating quality of some of your peaches. Any favorites? I’ve got an old peach whose rootstock suckers I’ve let grow, and over the last couple years I’ve been grafting on peaches and nectarines that I want to test. A friend nearby has a large, old Flordaprince peach and I’m always amazed at how early they’re ready to eat — way before summer even starts. That is a winner of an early peach. You’re right! In the photo at the very top, those red blossoms are from Red Baron. That tree is mostly Snow Queen nectarine, but two branches are Red Baron peach and those two branches steal the attention from the Snow Queen flowers every spring. I’ve got more peach leaf curl than in past years too, but I’ve never sprayed for it. My perspective is that it comes and goes with the weather, and it’s just cosmetic. Yes, indeed, I’d love a follow up report on your actual fruit set. I’ll also give a follow up on mine and the others I observe, either as an update to this post or in the comments or as a new post. I’m especially interested in apricot and pluot fruitset, as I’m trying to gather information to write posts about those. Thanks! My Lapins cherry put out leaves a few weeks ago and just a few days ago put out one flower. Since I wrote my stone fruit report above the Royal Lee has obviously set fruit, and a bunch of it. The Minnie Royal still seems to be in despair so something else definitely pollinated the Royal Lee. The Candy Heart pluerry has also definitely set fruit as have ALL of the pluots. This will be a great year for backyard fruit without question. I’ll look for a new post on fruit quality but for now I’ll share what I remember from last year about how some taste. My wife and I universally agree that the Arctic Star white nectarine is about the sweetest and tastiest of what we’ve gotten so far. It produces right around June 22 or so. The tropic snow and august pride make a nice big peach and they both taste really good. Not much to report on the apricots or pluots but I know that of what we’ve picked it’s been good. Her favorite is the emerald drop which doesn’t produce as much as the other varieties on that 4 in 1 tree. The early varieties are pretty darn good considering that they start coming in around late April and early May. There’s no summer heat this early but they manage to sweeten up and please. The plums, as you can imagine, are summer candy when they come in. I can’t comment on the Santa Rosa, though, as I spent the last several seasons beating it back as it was very dominant in our 5 in 1 tree. I’ll finally get to try it this year. Obviously, taste is really about who’s tasting it, but I can safely say that all of the fruit here is good to great but that’s no surprise as it’s all backyard grown and picked at the right time. By the way, the green beetles are really good at telling you when something is ripe so when I see them start in I know it’s time to see for myself if they’re right and in the process snip a beetle or two to the ground (great chicken food). Unrelated, before we got chickens we had green beetles of biblical proportions but after we got chickens the population was decimated. Our chickens roam freely during the day and I let them have complete access to the vegetable garden in the winter. My assumption is that they found and ate all the grubs. I’ll be curious to see whether the fruit set on your Royal Lee cherry holds without the cross pollination from Minnie Royal. Ever since my mom lost her Royal Lee, her remaining Minnie Royal appears to set some fruit each spring but then drops all of them before maturity. You’ve made me really eager to taste Arctic Star. Next year I should get fruit on mine. Thanks for reminding me to run my chickens under the fruit trees. There is one area that I haven’t given them access to, but I need to because I’ve noticed exactly what you’ve noticed: they perform amazing bug control. I'm Greg. My goal is to help others grow some food at home, with a focus on vegetables and fruits -- especially avocados -- in Southern California. I write a new "Yard Post" every Friday. Eric on Should you grow vegetables from seeds or plants?